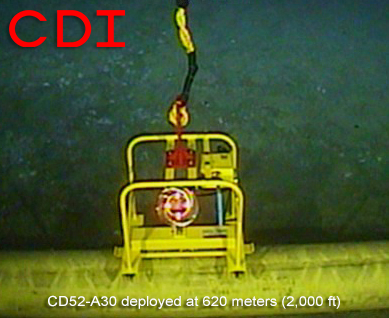 The CD52 family of products allow for easy, clamp-on, non-intrusive pig passage detection to depths of 3000 meters (9850 ft) for the CD52-A30 or 4500 meters (14750 ft) for the CD52-A45. Non-intrusive means fewer problems with maintenance and corrosion and no possibilities of leaks. 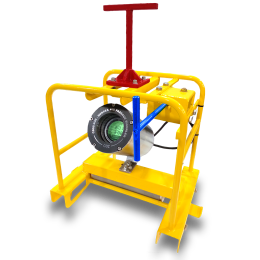 Simple isolation pads may be placed between the detector and the pipe to ensure zero possibility of galvanic corrosion. CDI has been manufacturing the patented CD52 family of pig signaler for almost 10 years. With thousands of systems installed around the globe, the CD52 family has a reliable performance record in burning deserts, frozen tundras and everything in between. 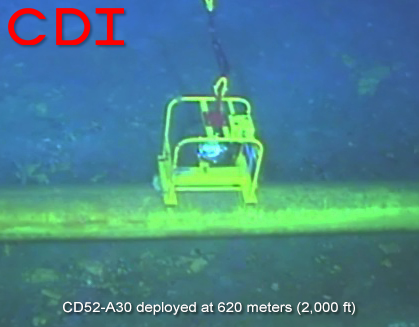 Many of CDI’s customers and large oil and gas producers who rely upon the CD52 family of equipment to set valves, control pump stations and interface to SCADA systems. The CD52-A30 and CD52-A45 are fully battery powered and require no existing infrastructure. Two common D-Cell alkaline batteries provide a full five (5) years of life. Changing batteries is as simple as unscrewing the face of the unit, removing the old batteries and inserting two new ones. The sensing means of the CD52-A30 and CD52-A45 is a set of patented, non-intrusive proprietary noise cancelling antennas. This clever antenna scheme was invented by CDI specifically for use in pig passage detection and is available in all CD52 family products. Using this antenna system gives the CD52-A30 its ability to reject nearby magnetic noise and halt costly false positive triggering. Simply placing a small, safe, permanent magnet onto the pig is all it takes to start using the CD52-A30 or CD52-A45 system. 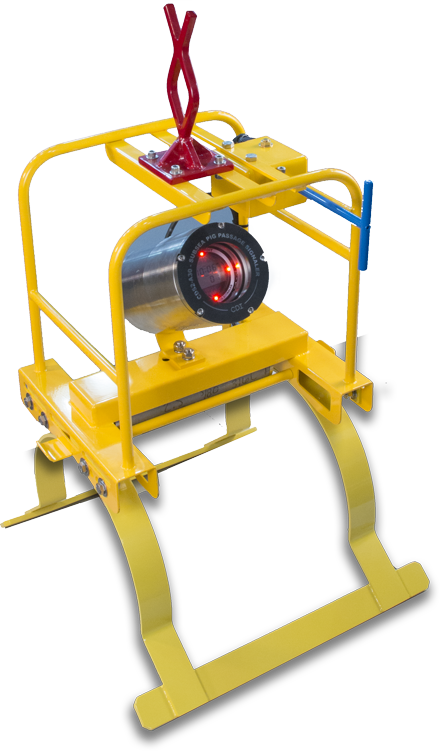 A battery powered acoustic pinger allows remote signaling of a pig passage to any surface going vessel.Simply lower the receiving acoustic transducer over the side of the vessel and listen for the 1 second pings. 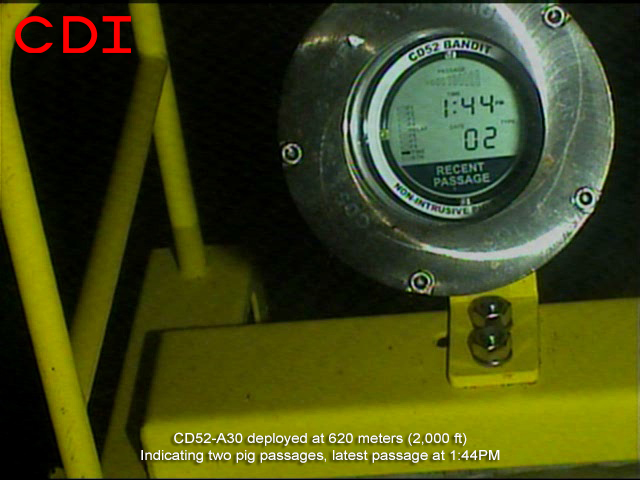 By default the CD52-A30 and CD52-A45 pig signalers ping to indicate a pig passage for a period of 36 hours. 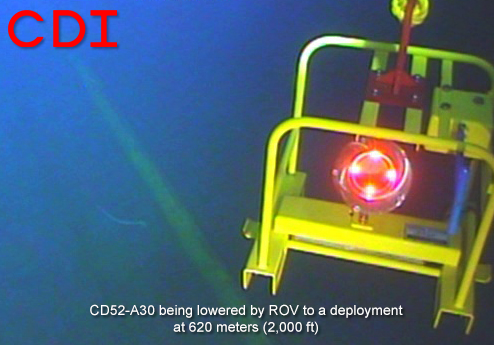 The CD52-A30/A45 system is small and lightweight enough at 35 lbs (16kg) to be deployed by divers, while at the same time being robust and durable enough to survive the rigors of deep-sea deployment using ROVs. 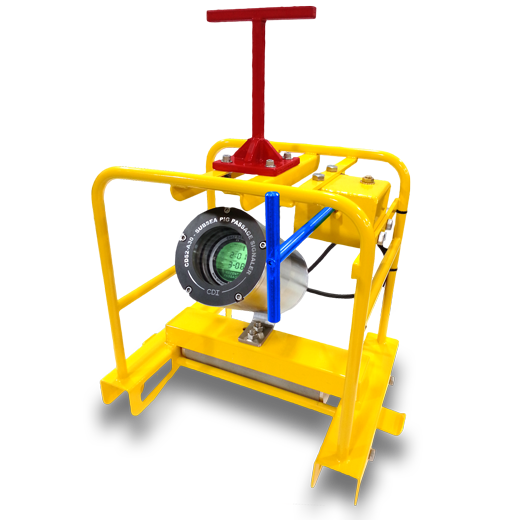 The CD52-A30 and CD52-A45 may be optionally purchased with a protective cage shown above. But regardless of the configuration chosen, the systems can be on site and ready for work within days. 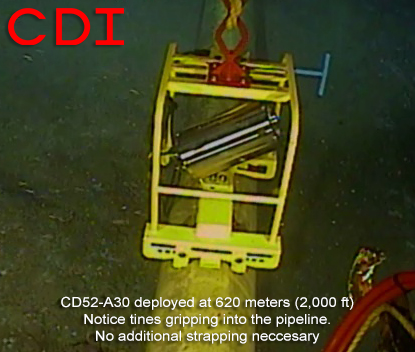 Deep water installation with an ROV is quick and easy with CDI's Quick-Clip deployment design. The CD52-A30 and CD52-A45 simply snap onto the pipeline. Overal Dimensions: 16" x 10" x 18"
[0.4m x 0.25m x 0.45m] 16" x 10" x 18"
** Minimum 30 days of ping/flash time available. Overall battery life is dependent upon requested duration of ping/flash after each pig passage.